Tip: click on any image to see a larger view. Top Banner: Where Do I Start? The words in the black banner at the top of the page describe broad categories of services and needs. Each is a link to more information. If you rest the mouse on the words in the black banner you’ll see a description of what is included in each category. You can also go to the Table of Contents for a single-page view of what is covered in the Guide (the link is on every page right under the search box in the upper right). First Steps: includes information on the paperwork you need to have in hand, as well as information on your rights and responsibilities, and the main agencies that can help you. Basics: covers just that – food, clothing, shelter, transportation, cellphones. Categories: What Can I Find? Look at the Basics page below. You’ll see that there is general guidance at the top of the page, a “Perspectives” tip from WILC’s Partners for Success program and an “In this section” box that is the jumping off point to more specific information. Not every page will look exactly the same. For example, if you select the “Food” page, you will see guidance at the top that is just on the topic of food. This is followed by a list of links to agencies that provide the service. Agencies: Who Can Help Me? If you click on the agency name a new window will open when you see this image and you will see the agency’s webpage. If you click on “Continue reading about this agency” you’ll be taken to a page that describes what the agency does and information that we think is especially relevant, such as who in the agency works with people navigating re-entry, probation or parole. Under the agency name you will see tags for where else the agency is found in the guide. This gives you a sense of what they do in the community. When you look at a specific agency record, you will see links that let you “jump to” information you need in the record. Navigating: How Do I Move Around On the Site? Once you leave the home page, you will see a trail of “breadcrumbs” under the banner that make it easy to back up to where you started. Look at the breadcrumbs on this page. You can also return to the HOME button in the black banner or use the Table of Contents or Search Box that appear in the upper right corner of every page. WILC Tips: Viewpoints from the Partners for Success Program are pages that offer advice and encouragement from the Westchester Independent Living Center’s re-entry program, Partners for Success. 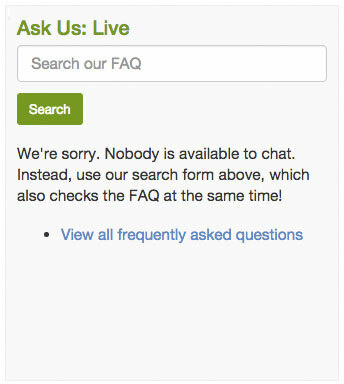 If you get stuck or are not finding what you need, contact us directly by clicking on the green and blue librarian button that appears on the right on every page. We’ll do our best to get back to you within two business days. Email us. This is a form that sends us your name, a way to contact you, and a question. We’ll do our best to get back to you in two business days. Ask Us: Live. This section lets you send your question to a librarian right away. This is a form that sends us your name, a way to contact you, and a question. We’ll do our best to get back to you in two business days. When available, a librarian will be able to type messages back and forth with you right away. 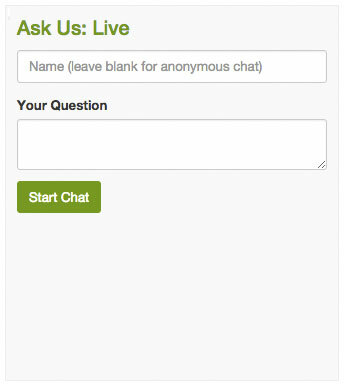 You will know that someone is available or not by the green button — if it says “Start Chat,” you will be able to send in your question to a person waiting for it. 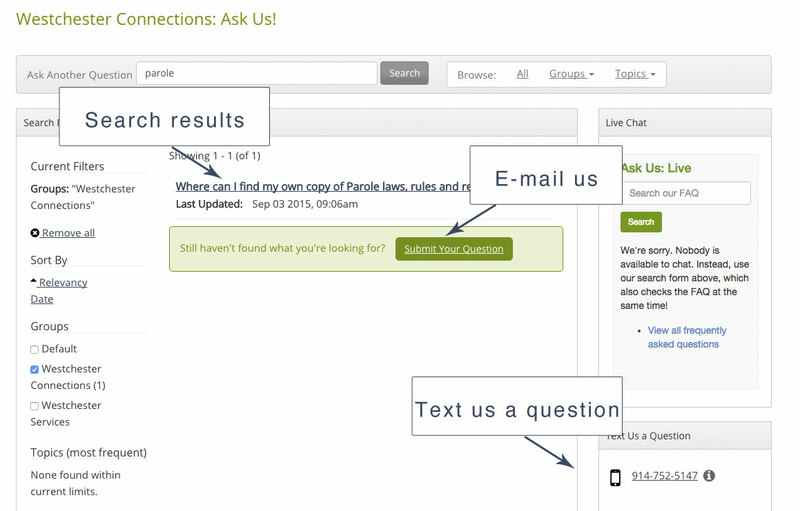 If it says “Search,” you can use the search box to look for an answer to your question. Maybe someone has asked the same question before, and we already have your answer! There are questions that almost everyone has. These are Frequently Asked Questions, or FAQ. Our service lets you search through these FAQs. For example, if you search for “Parole,” you can find an answer that has the word “parole” in it. You also have another chance to email us with your question if you didn’t find what you were looking for. You can also text us a question using your cellphone. Our text number is 914-752-5147. (If you’re reading this on your cell phone, clicking that link will open up your text message screen.) Please note that standard messaging rates may apply. Westchester Connections contains only a selective listing of resources in Westchester County. We’ve checked services and phone numbers and will do our best to keep this information current throughout the year. If you feel we’ve missed a particularly valuable resource, please send that information to us using the “Ask Us a Question” form.